Physical Education is an integral part of education programme, designed to promote the optimum development of an individual. It makes one physically, and mentally strong. The primary aims of physical education have varied based on the needs, time and place. GSSSIETW is always enthusiastic in organizing inter-zone competitions, inter-departmental sports activities during Geethayaana. Students have participated in state and national level events. To provide adequate infrastructure facilities for sports and games, so that students chooses to participate in the event for which they have flair. To spot and groom the women sports talent to faster, better and higher relations through sports and games. To provide the adequate physical education facilities and program, that are wholesome and attractive so has to enshrine sound mind in a sound body. To produce national and international women players. Providing high-tech sports facilities to the students to attain the top most position in sports arena of the university colleges. 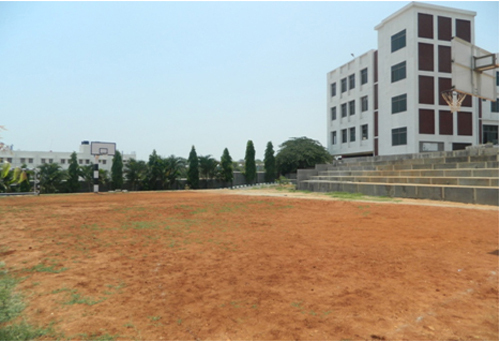 GSSSIETW provides the sports facility to meet the students requirements and university standards. GSSSIETW launched Multi-Gym on 01/10/2016 at GSSSIETW campus. This provides Fitness Training, Weight Loss/ gain, Aerobics classes. 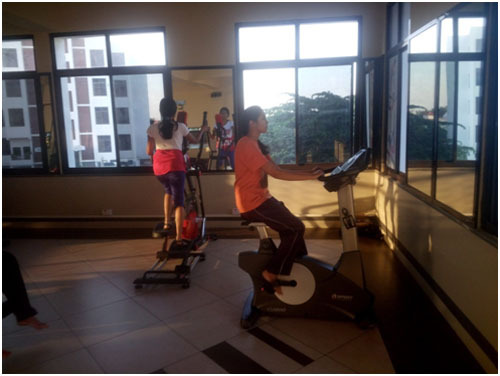 Gym is equipped with well modernized equipments like CU upright bike, E Glide elliptical, Multi station GYM EXM, Infinite rower model, Commercial use step board, Neoprene ankle weight 2.0 Kg, Anti burst gym ball, Dumbbells. 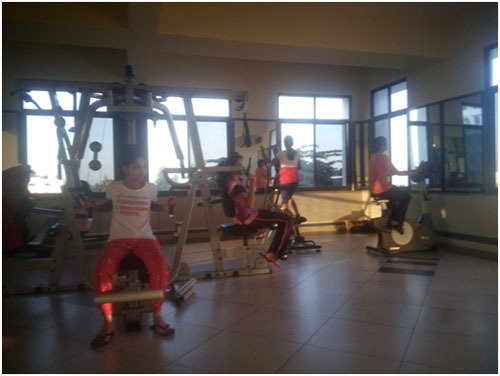 Around 20 students are taking befit of the Gym. 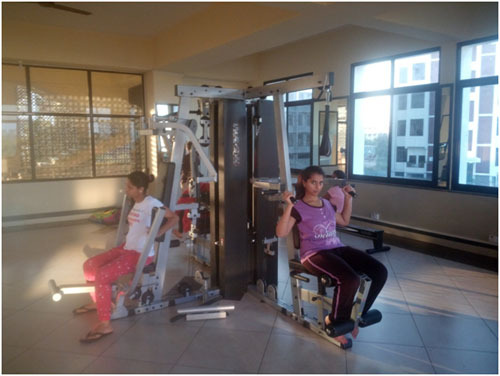 Students are trained by well experienced Gym instructor. The Gym runs in 2 sessions From morning 6Am to 8 Am and in the evening 5Pm to 7Pm. Fom Left: Shivaram Reddy, Physical Education Director, BMSCE, Bengaluru, Swathi R, Bhavana, Preeya D, Dr. K Guruprasad, Principal, BMSCE Evening College, Bengaluru, B.N. Harish Gowda, Physical Education Director, GSSSIETW, Mysuru, Suhani, Vishwanath, Physical Education Director, RVCE, Bengaluru. Sitting from Left: Bhumika, Impana, Nikitha, Nishchitha, Anvitha Muthamma. GSSSIETW, Mysuru students have secured 1st Place in the “VTU Rest of Bengaluru Zone Hand Ball Tournament” and the team got qualified to “VTU Inter Zone Hand Ball Tournament”, held at MCE Hassan. Based on the performance of teams in the tournament, Top 8 teams from various colleges across Karnataka were qualified to “VTU Inter Zone Hand Ball Tournament held at MCE Hassan teams were selected, GSSSIETW is one among top 8 teams. Who were qualified to “VTU Inter Zone Hand Ball Tournament”. 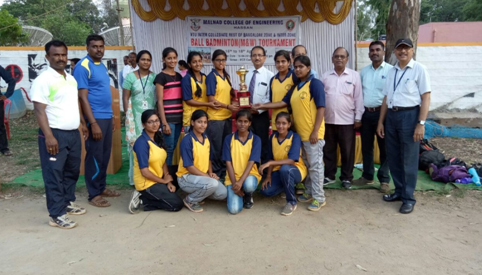 In the VTU Inter Zone Hand Ball Tournament which was held at BMSCE, Bengaluru on 30th March 2019, GSSSIETW, Mysuru students got 3rd Place. Fom Left: Dr. S N Ravi Shankar, Dean-Student Affair, Dr.K S Jayantha, Principal-MCE, Hassan, B.N. Harish Gowda, Physical Education Director, GSSSIETW, Mysuru, SomaShekar, Physical Education Director, MCE, Hassan, Suhani, Nikitha, Preeya D (Captain), Bhavana, Swathi R, Bhoomika, Impana, Nishchitha B R, Anvitha Muthamma. GSSSIETW, Mysuru students have participated in the “VTU Rest of Bangalore Zone Hand Ball Tournament” on 27th and 28th March 2019 at Malnad College of Engineering, Hassan and secured Winner in Hand Ball Tournament. The final match held between GSSSIETW, Mysuru and Malnad College of Engineering, Hassan. 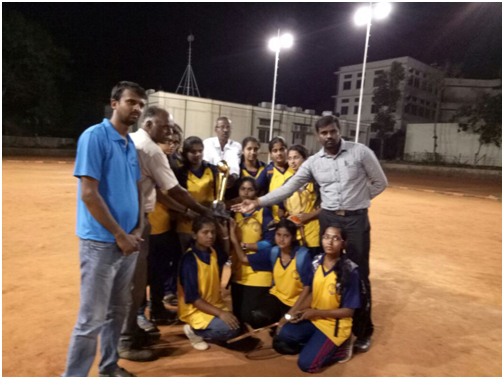 The tournament was won by GSSSIETW, Mysuru and qualified for Inter Zone Hand Ball Tournament to be held on 30th March 2019 at BMSCE, Bangaluru. Prarthan K M &amp; Nikitha. 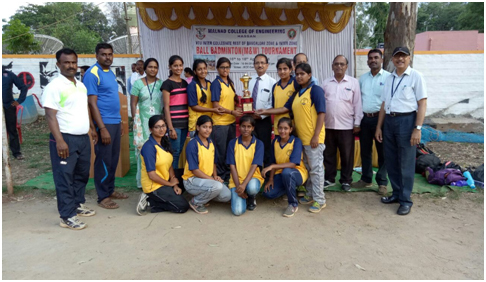 GSSSIETW, Mysuru students have participated in the “Mysuru City Inter Collegiate Hand Ball Tournament” on 26th Feb 2019 at VVIET, MYSURU and secured runner-up in Hand Ball Tournament. 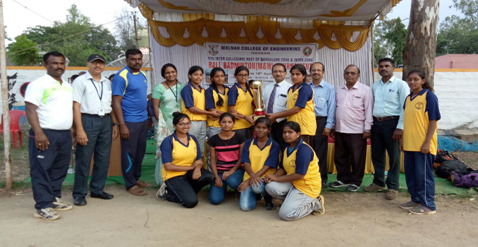 “Mysuru City Inter Collegiate Hand Ball Tournament” was organized by Vidya Vikas Institute of The final match held between GSSSIETW, Mysuru and Terisian First Grade College, Mysuru. The tournament was won by Terrisian First Grade College, Mysuru and GSSSIETW, Mysuru secured runner up position. 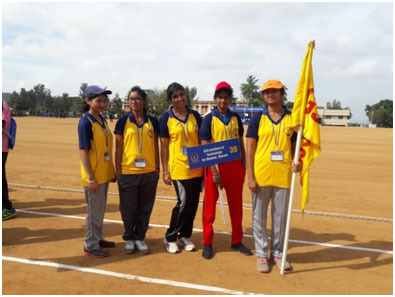 GSSSIETW, Mysuru participated in various sports events and secured runner-up in Volley Ball and 3 rd place in Throw Ball in the ‘Sports fest’ organized by Sri Vishnu Engineering College for Women, Bhimavaram, Andra Pradesh, from 6 th to 8 th March 2019 in its campus. Nearly 14 colleges from various states participated in the sports fest. GSSSIETW has participated in VTU Rest of Bangalore- Zone Handball tournament. 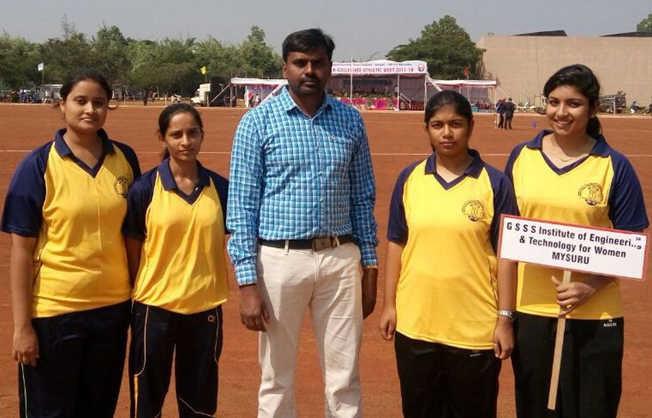 From Left: Varshini, Prarthan N, Rachana Selar, Swathi S, B. N. Harish Gowda, Physical Education Director, GSSSIETW, Mysuru, Sadananda, Physical Education Director JNNCE, Bhavana. Sitting from left: Preeya D, Nishcitha B R, Anvitha Muthamma, Jestina J Fedric. The final match was held between Alva’s Institute of Engineering and Technology, Moodabidare and GSSSIETW, Mysuru. GSSSIETW has secured runner up position in VTU Inter-zone Ball Badminton Tournament. From Left: Somashekar, Physical Education Director, MCE, Hassan, B. N. Harish Gowda, Physical Education Director, GSSSIETW, Mysuru, Varshitha S N, Kavitha Nagaraj, Tanushree S, Dr. K Jayanth, Principal, MCE, Hassan, Sangeetha, Sandyshree B M, Nagesh, VTU Regional Director of Hassan Zone. Sitting from left: Ananya, Nethravathi, Tejaswini D, Uma D.
VTU rest of Bangalore - Zone Ball Badminton Tournament was held at MCE, Hassan from 16th to 17th April 2018. The final match was held between Alva’s Institute of Engineering and Technology, Moodabidare and GSSSIETW, Mysuru. GSSSIETW has won in VTU Rest of Bangalore - Zone Ball Badminton tournament. From Left: Somashekar, Physical Education Director, MCE, Hassan, Dr. S N Ravishankar, Dean, MCE Hassan, B.N. Harish Gowda, Physical Education Director, GSSSIETW, Mysuru, Nethravathi, Kavitha Nagaraj, Tanushree S, Sangeetha, Dr. K Jayanth, Principal, MCE, Hassan, Dr. M S Ravishankar, Vice-Principal, MCE, Hassan, B M Nagesh, VTU Regional Director of Hassan Zone. Uma D. Sitting from left: Ananya, Varshitha S N, Tejaswini D, Sandyshree. Alva’s Institute of Engineering and Technology, Moodabidare, from 4th May 2018 to 5th May 2018. GSSS Institute of Engineering & Technology for Women, Mysuru, has secured runner up in VTU Rest of Bangalore – Zone kabaddi tournament. Fom Left: B.N. Harish Gowda, Physical Education Director, GSSSIETW, Mysuru, Nithin, Physical Education Director, Alva’s Institute of Engineering and Technology, Moodabidare, Dr. Peter Fernandis, Principal, Alva’s Institute of Engineering and Technology, Moodabidare,, Nethravathi, Sindushree K M, Vindya S R, Monica V, Nisarga R, Sitting from left: Bindu R, Anvitha Mthamma K C & Shruthi H S.
Visvesvaraya Technological University, Belagavi, in association with Alva’s Institute of Engineering and Technology, Moodbidre, organized VTU Rest of Bangalore-Zone Kabaddi tournament from 4th May 2018 to 5th May 2018. The final match was held between Alva’s Institute of Engineering and Technology, Moodabidare and GSSSIETW, Mysuru. GSSSIETW has secured runner up in VTU Rest of Bangalore - Zone Kabaddi tournament. VTU INTER- ZONE KABADDI TOURNAMENT Held at Chennabasaveshwara Institute of Engineering,, Gubbi, from 7th May 2018 to 9th May 2018. 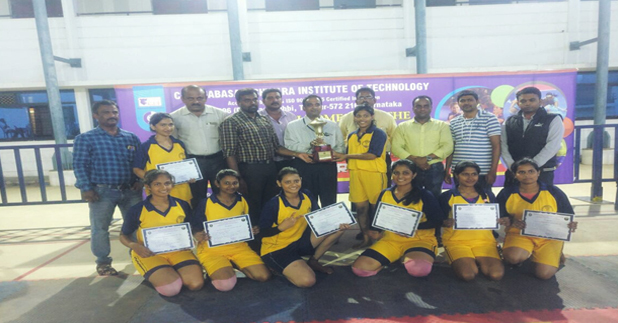 GSSS Institute of Engineering & Technology for Women, Mysuru, has secured runner up in VTUInter– Zone kabaddi tournament. Fom Left: B.N. Harish Gowda, Physical Education Director, GSSSIETW, Mysuru, Jagadish, Physical Education Director, CIT, Gubbi, Dr. Rajagopal, Prof & Head, Department of EEE, CIT, Gubbi, Mohammed Ismail, Association Kabaddi Coacher, Nethravathi, , Sitting from left: Bindu R, SinduShree K M, Vindya S R, Monika V, Nisarga R, Shruthi H S & Anvitha Mthamma K C.
Visvesvaraya Technological University, Belagavi, in association with Chennabasaveshwara Institute of Engineering, Gubbi, organized VTU Inter-Zone Kabaddi tournament from 7th May 2018 to 9th May 2018. The final match was held between Alva’s Institute of Engineering and Technology, Moodabidare and GSSSIETW, Mysuru. GSSSIETW has secured runner up in VTU Inter-Zone Kabaddi tournament. GSSSIETW Students have won VTU rest of Bangalore zone Ball badminton tournament held at MCE Hassan on 16th & 17th April 2018 & qualified for VTU inter Zone Ball Badminton tournament. Fom Left: Somashekar, Physical Education Director, MCE, Hassan, B.N. Harish Gowda, Physical Education Director, GSSSIETW, Mysuru, Varshitha S N, Kavitha Nagaraj, Tanushree S, Dr. K Jayanth, Principal, MCE, Hassan, Sangeetha, Sandyshree B M, Nagesh, VTU Regional Director of Hassan Zone. Sitting from left: Ananya, Nethravathi, Tejaswini D, Uma D.
Visvesvaraya Technological University, Belagavi, in association with MCE, Hassan, organized VTU Inter-zone Ball Badminton tournament on 17th April 2018 and 18th April 2018 at MCE, Hassan. Fom Left: Somashekar, Physical Education Director, MCE, Hassan, Dr. S N Ravishankar, Dean, MCE Hassan, B.N. Harish Gowda, Physical Education Director, GSSSIETW, Mysuru, Nethravathi, Kavitha Nagaraj, Tanushree S, Sangeetha, Dr. K Jayanth, Principal, MCE, Hassan, Dr. M S Ravishankar, Vice-Principal, MCE, Hassan, B M Nagesh, VTU Regional Director of Hassan Zone. Uma D. Sitting from left: Ananya, Varshitha S N, Tejaswini D, Sandyshree. Visvesvaraya Technological University, Belagavi, in association with MCE, Hassan, organized VTU Rest of Bangalore-Zone Ball Badminton tournament on 16th April 2018 and 17th April 2018 at MCE, Hassan. The Management, Principal and the faculty of GSSSIETW, congratulate the winning teams on their success. Ms. Manushree. R of 8th semester from the Department of EEE; Ms. Thanushree. S of 8th semester from the Department of ECE; and Ms. Kavitha of 4th semester from the Department of TCE branch, GSSSIETW, Mysuru have been selected to represent Inter University All India Ball Badminton Tournament that will be held at Dravidian University, Kuppam, Andhra Pradesh from 5th to 9th January 2018. 1 VTU Athletic meet. Held at Dr. T Thmmaiah Institute of Technology held at Kolar from 15th to 18th November 2016. 2 VTU single zone Inter collegiate Taekwondo Tournament. Held at VDRIT Uttara Kannada from 20th to 22nd October 2016. 4 VTU Single Zone Yoga Tournament. Held at PESIT Shimoga from 16th to 18th October 2016. 5 17th Invitational National Karte Championship 2016. Organized by KEN Bu KAI SHITO RYU Karate School of India held on 23rd, 24th of April at Calicut, Kerala, . VTU Mysuru Zone Table tennis Tournament. Held at GSSSIETW, Mysuru. The tournament inaugarated by Smt. Devaki Madhav National table tennis player, Mysuru. In the presence of Smt. Vanaja B Pandit, Hon. Secretary, GSSS®, Dr. Sumithra Devi K A Principal, GSSSIETW, Smt. Anupama B Pandit, AAO, GSSSIETW and Sri. Harish Gowda B N, Physical Education Director, GSSSIETW, Mysuru. Fom Left: Sneha Teggi, Sandhyashree B M, Thanushree S, B.N. Harish Gowda, Physical Education Director, GSSSIETW, Mysore, Sri J Nagendra Swamy, CEO, RLJIT, Doddaballapur, Kavya P J, Poorani, Ashiba S R, Sangeetha K S, Meghana S, Manushree R.
Visvesvaraya Technological University, Belagavi, in association with RLJIT Doddaballapur, organized VTU Interzone Ball badminton tournament from 10th April 2017 to 11th April 2017 at RLJIT, Doddaballapur. 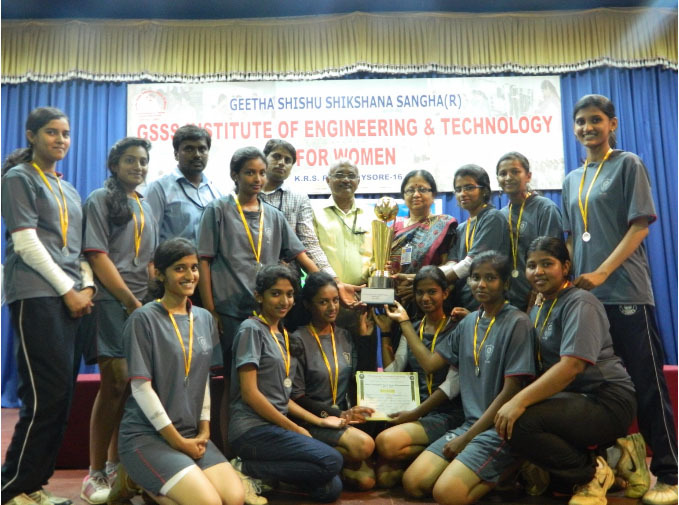 The final match was held between Alva’s Institute of Engineering and Technology, Mangalore and GSSSIETW, Mysore. GSSSIETW has secured Runner up position in Ball badminton tournament. VTU REST OF BANGLORE ZONE HANDBALL WOMEN TOURNAMENT Held on 31 st March 2017 at JNNCE, Shimoga. 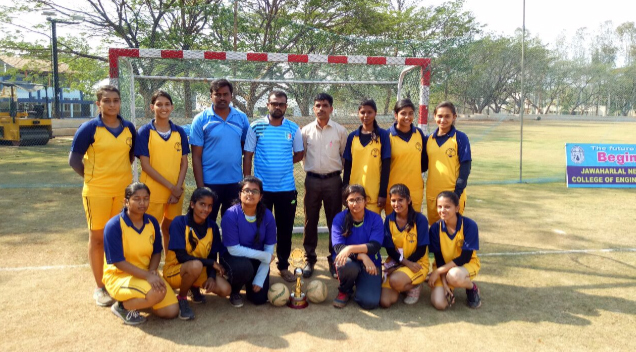 Fom Left: Rachana Selar G, Deepthi S, Harish Gowda B N, Physical Education Director, GSSSIETW, Mysuru, Muruli, Physical Education Director, ATME, Mysuru, Justina J Fiedrick, Prarthan, Swathi R, Varshini S, Preeya D, Safeenaz Jameel, Varshitha R, Varshini M, Swathi Murulidhar. Visvesvaraya Technological University, Belagavi, in association with JNNCE, Shimoga, organized Rest of Bangaluru zone Handball tournament on 31 st March 2017 at JNNCE, Shimoga. 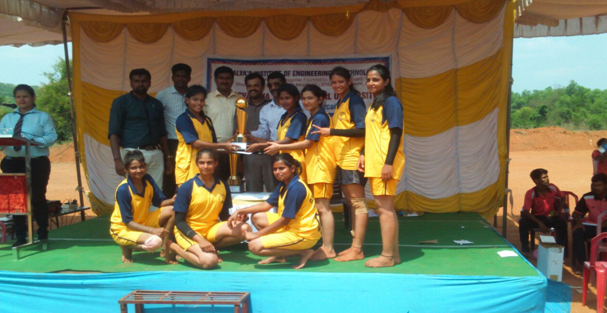 GSSSIETW has secured Third place against Sahyadri College of Engineering, Mangalore, in Handball tournament. VTU REST OF BANGLORE ZONE BALL BADMINTON TOURNAMENT Held on 28th March 2017 at PES College of Engineering, Mandya. Fom Left: B.N. Harish Gowda, Physical Education Director, GSSSIETW, Mysore, Chinne Gowda, Physical Education Director, PES Mandya, Puutaswmy Gowda, Regional Director, Mysuru, Pooja R, Manushree R, Ashiba S R, Kavya P J, Sangeetha K S, Sneha Teggi, Poorani A, Kavitha, Thanushree S, Meghana S, Sandhyashree B M.
Visvesvaraya Technological University, Belagavi, in association with PES Mandya, organized Rest of Bangaluru zone Ball badminton tournament on 28th March 2017 at PES College of Engineering, Mandya. The final match was held between Alva’s Institute of Engineering and Technology, Mangalore and GSSSIETW, Mysore. GSSSIETW has secured Runner up position in Ball badminton tournament. The following students participated in VTU Inter Collegiate Kabaddi Tournamentheld atVSMIT, Nipani on 19th April 207. List of Students: Vindhya S R( II Sem ECE), Sushmitha T S (II Sem ECE), Kavya C (II Sem EIE), Pragathi R Gowda ya B(II Sem CSE), Nethravathi M (IV Sem TE), Kavya B D(VIII Sem EIE), Shwetha A S (IV Sem MBA), Nisarga R (IV Sem EEE), Soujanya (IV Sem CSE). List of Students participated: Kavya B (I Sem ISE), Anvitha Muthamma (I Sem CSE ), G Chethanasrimayi (I Sem ECE), Monika V (I Sem CSE), Prarthan K M (III Sem CSE), Jeevith G M (VII Sem ECE), Kavya C (III Sem EIE). 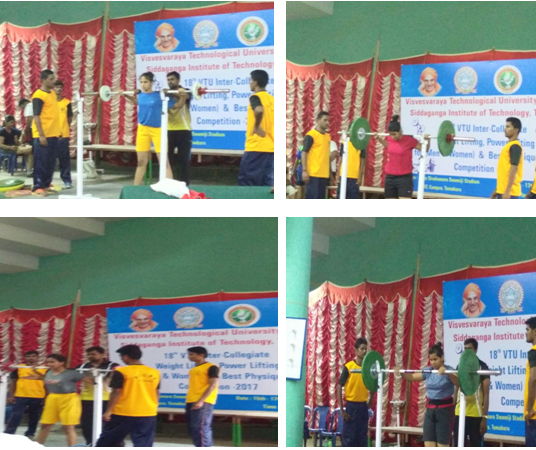 The following students participated in VTU Single Zone Inter Collegiate Weight Lifting & Power Lifting Tournament Held at SIT, Tumkur on 15th to 17th September 2017. Kavya C from GSSSIETW has won a Bronze medal in Power Lifting below 52kg category and Jeevith G M from GSSSIETW has won a Bronze medal in Power Lifting above 82kg category. VTU Mysuru Zone Inter Collegiate Throw ball Tournament Held at GSSSIETW, Mysuru on 6th to 7th October 2017. GSSSIETW, Mysuru organized VTU Mysuru Zone Throw ball Tournament-2017 on 6th October 2017 in association with Visvesvaraya Technological University, Belagavi. During Inaugural function: From Left: Dr.Sumithra Devi K A, Principal, GSSSIETW, Mysuru, Sri Puttaswamy Gowda Regional Director, VTU Sports wing, Mysuru, Sri. M S Subramanya, Physical Education Director, Omkarmal Somani College of Education, Saraswathipuram, Mysuru. Sri R K Bharath, Board member & CEO GSSS®, Mysuru, Sri. B. N. Harish Gowda, Physical Education Director, GSSSIETW, Mysuru. 8 teams from various VTU affiliated colleges of Mysuru zone were participated in the tournament. The final match was held between NIE, Mysuru and NIEIT, Mysuru. The Tournament was won by NIE, Mysuru. Organized by: VTU Campus Belagavi from 3rd to 6th Nov. 2017. Prarthan K M (First from right side) secured Fourth Place of Penthalon Events. Miss. Amulya D M, VI semester Electrical & Electronics Engineering branch of GSSSIETW, Mysuru has been selected to represent Inter University All India Taekwondo Tournament to be held at Maharshi Daynanda University, Rohtak from 15th to 21st March 2017. VTU Athletic meet at Dr. T Thimmaiah Instituite of Technology Kolar. The following students participated in VTU Athletic meet at Dr. T Thmmaiah Institute of Technology held at Kolar from 15th to 18th November 2016. List of Students: Kavya C ( I Sem EIE), Vindhya S R (I Sem ECE), Sushmitha T S (I Sem ECE), Prarthan (I Sem CSE), Pragya K P( III Sem EIE). VTU single zone Inter collegiate Taekwondo Tournament at VDRIT Uttara Kannada. VTU Inter Collegiate Mysore Zone Women Throw ball Championships 2016. The following students participated in VTU Inter Collegiate Mysuru Zone Throw ball Championships 2016 held at NIEIT Mysuru on 17th September 2016. List of Students: Preeya D ( I Sem ISE), Rachana Selar (I Sem ECE), Tanuspoorthi M S (V Sem CSE), Varshitha (III Sem ISE), Nisarga ( III Sem ISE) Swathi T Shetty (V Sem CSE), Sonu P (VII Sem ISE), Chandana J( V Sem ECE), Rakseni(I Sem CSE), Pallavi S P (I Sem ISE), Aishwarya M (I Sem CSE), Bhumica M J (V Sem CSE). The following students participated in VTU Single Zone Yoga Tournament at PESIT held at Shimoga from 16th to 18th October 2016. List of Students: Surabhi G Won First Place ( I Sem CSE), Chaya M A (VII Sem ECE). VTU Mysuru Zone Table tennis Tournament at GSSSIETW. VTU Belagavi in association with GSSSIETW, Mysuru organised VTU Mysuru Zone Table tennis Tournament on 27th September at GSSSIETW , Mysuru. The tournament inaugarated by Smt. Devaki Madhav National table tennis player, Mysuru. In the presence of Smt. Vanaja B Pandit, Hon. Secretary, GSSS(R), Dr. Sumithra Devi K A Principal, GSSSIETW, Smt. Anupama B Pandit, AAO, GSSSIETW and Sri. Harish Gowda B N, Physical Education Director, GSSSIETW, Mysuru. The following students participated in VTU Mysuru Zone Table tennis Tournament: Akhila M jain ( III Sem TCE), Anusha C A(VII CSE), Ujwala Kini H (V Sem ECE), Mahima R(V Sem EIE), Mouna Machamma (V Sem EEE), Lavanya H R (V Sem ECE). 17TH INVITATIONAL NATIONAL KARATE CHAMPIONSHIP 2016 organized by KEN Bu KAI SHITO RYU Karate School of India held on 23rd, 24th of April at Calicut, Kerala, In which students of GSSS Institute of Engineering and Technology for Women have participated and bagged 4 gold, 6 silver and 5 bronze under the guidance of Sensei Stafford Michahial of OKINAWA SHORIN KAI KARATE DO, Asst professor Department of EIE GSSSIETW. G M Jeevith of IV semester of ECE dept. represented VTU in ALL INDIA INTER-UNIVERSITY TAEKWONDO(Women) Competition held at Guru Nanak Dev University, Amritsar, Punjab from 17th to 18th March 2016. Naija Anand V of VIII semester ISE dept. represented VTU in ALL INDIA INTER-UNIVERSITY South zone Competition s held at Krishna University , Machilipatnam , Andra Pradesh from 11th to 15th February 2016. GSSSIETW Mysuru student won , Silver and Bronze medals at 12th National Ice skating Championship. Miss. Benazir Meera final year student of EEE branch GSSSIETW, Mysuru participated in the National Ice skating Championship held at Gulmarg, Jammu & Kashmir , from 30th December 2015 to 3rd January 2016, and won the S,T Speed 100 meters Silver and 500 meters Bronze medal. Students represented GSSSIETW at VTU Mysuru Zone and Rest of Bangalore Zone and Inter zone sports events. 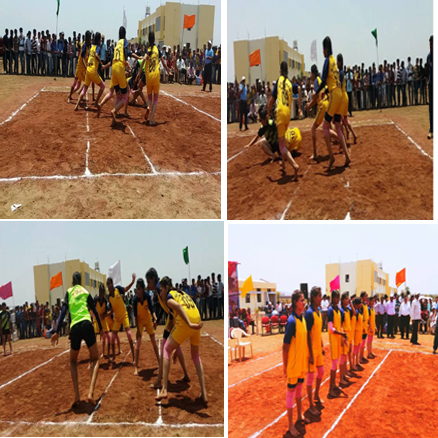 Students participated in VTU Rest of Banglore Zone Kabaddi tournament held at JNNCE, Shimoga from 29th to 30th April 2016. List of Students: Kavya B D(VI ECE) Yashaswini M S (VI ECE ) Ramya C P (VI EEE) Varshini M S ( VI EEE) Nisarga R (II EEE) ,Shwetha A S(MBA) Sowmys (II ECE) Spoorthi H P(IV EEE). They have secured IV position in VTU Rest of Banglore Zone Kabaddi tournament, and were qualified for Inter Zone Kabaddi tournament. Students participated in VTU Rest of Banglore Zone Volleyball tournament held at GSSSIETW, Mysuru from 22nd to 23rd February 2016. List of Students: Naija Anand, Chandan N, Aishwarya Gowda S R, Advika N, Shradi R Rao, Pooja, M, Bhagya, Supriya P.
Students participated in 18th VTU Athletic meet held at Sir MVIT Bangalore. List of students: Shwetha A S(MBA), Shalini (MBA), G M Jeevith (VI ECE), Kamarunnisa K M(VI ISE) Prakruthi M (VI ISE), Pooja M (II EIE),Sushma J Shetty(VI ECE), Pragya K P (II TCE). VTU Rest of Bangalore Zone Volleyball Tournament held on 22nd February 2016 at GSSSIETW. VTU Belagavi in association with GSSSIETW Mysuru organized Rest of Bangalore Zone Women’s Volleyball tornament on 22nd February 2016 at GSSSIETW Mysuru. The tournament inaugurated by Smt. Dr. Savitha Prashanth, Former Indian Basket Ball Player Mysuru. In the presence of Smt. Vanaja B. Pandit, Hon. Secretary, GSSS(R), Bharath R K Board Member & CEO ,GSSS®, Anupama B Pandit AAO, GSSSIETW, Dr. Sumithra Devi K A Principal, GSSSIETW, Sri. B N Harish Gowda, Physical Education Director. The students of GSSSIETW participated in the VTU Mysore Zone Table Tennis Tournament held recently at SJCE, Mysuru Campus. 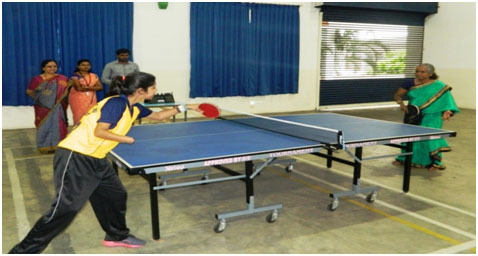 Students were selected for the VTU Inter Zone Table Tennis Tournament held at AIT, Chickmagaluru. GSSSIETW Team “Sitting from Left , Smt. Anupama B.Pandit, Asst.Administrative Officer, Dr. Sumithra Devi K A, Principal & Harishgowda B N , PED front sitting from left Anusha C & Akila M Jain, standing from left Akshatha , Ujwala N Kini, & Mouna Manchamma”. Fom Left: Student Participant, Harish Gowda B N, Physical Education Director, GSSSIETW, Rajesh Y H, Regional Director for sports, VTU-Bengaluru North, Sri.B.V.Srinivasa Gupta, Vice President, GSSS(R), Smt. Vanaja B. Pandit Hon. Secretary, GSSS(R), Dr.K.A Sumithra Devi, Principal, GSSSIETW, Dr..Reshma Chengappa, International Basket Ball player & Asst.Professor,Dept.of Economics, Maharani’s PG Centre, Mysore, Student participant. 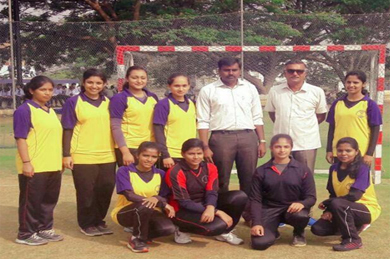 GSSSIETW Mysuru in association with Visvesvaraya Technological University, Belagavi, organized Inter zone women’s Throwball Tournament on 13th October 2015 at GSSSIETW, Mysore. The Tournament was inaugurated by Chief Guest Dr. Reshma Chengappa, International Basket Ball player & Asst. Professor, Dept. of Economics, Maharani’s PG Centre, Mysore. In her Inaugural talk he emphasized Importance of Sports in life. Sri. B.V. Srinivasa Gupta, Vice President, GSSS(R) presided the function. Smt. Vanaja B. Pandit Hon. Secretary, GSSS(R) was the Guest of honour. Principal Dr. Sumithra Devi K.A, Sri. B.N. Harish Gowda, Physical Education Director were present. 16 Inter-zonal winning teams participated from various Engineering Colleges of Karnataka under VTU. The final match held between NIEIT Mysuru and SJEC Mangalore, the Tournament was won by NIE-IT Mysuru. 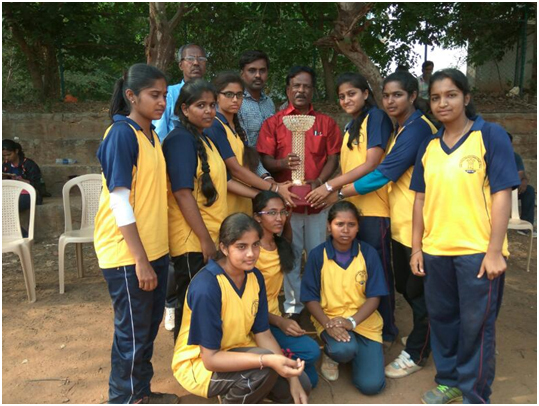 Winning Team(NIEIT, Mysuru) with Trophy. Fom Left: B.N. Harish Gowda, Physical Education Director, GSSSIETW, Mysore, Dr. A. T Eshwar,Professor and Head, Dept. of Mathematics, GSSSIETW,Mysore H.N. Shankaranarayana, Physical Education Director NIE, Mysore, Smt. Vanaja B. Pandit, Hon. Secretary, GSSS(R), Smt. Anupama B. Pandit, Assistant Administrative Officer, GSSSIETW, Mysore, Dr. M.V. Sathyanarayana, Incharge Principal, GSSSIETW, Mysore- with winning Team. The final match held between NIE, Mysore and NIEIT, Mysore, the Tournament was won by NIEIT, Mysore. Visvesvaraya Technological University, Belagavi, in association with GSSSIETW Mysuru, organized Mysore zone women’s Throwball Tournament on 8th October 2015 at GSSSIETW, Mysore. The Tournament inaugurated by Chief Guest Sri. H.N. Shankaranarayana, Physical Education Director NIE, Mysore. In his Inaugural talk he emphasized Importance of Sports in life. Dr. Jagannatha Shenoi, President, GSSS(R) presided the function. Smt. Vanaja B. Pandit Hon. Secretary, GSSS(R) was the Guest of honour. Chief Executive Officer Sri. R.K. Bharath, Assistant Administrative Officer Smt. Anupama B. Pandit and Incharge Principal Dr. M.V.Sathyanarayana, Sri. B.N. Harish Gowda, Physical Education Director were present. Dignitaries:- Dr. Sumithra Devi K A Principal GSSSIETW, Smt. Vanaja B. Pandit, Hon. Secretary, GSSS(R), Sensei Stafford Michahial. Sitting:-Bhavni Gumma, Monika, Sandya gowda. Mysuru Karate association has conducted 9th state level Dasara karate championship held on 17-10-15 Mysore in which students of GSSS Institute of Engineering and Technology for Women have participated and bagged 1 gold, 2 silver and 6 bronze under the guidance of Kyoshi Sunil Kumar Chief Representative Shorin Ryu Shorin Kai Asia, India, Sensei Stafford Michahial of Okinawa Shorin Kai Karate Do. Kamaru nisha receiving bronze medal in 50kg to 55kg category. GSSS Institute of Engineering and Technology for Women TAEKWONDO Students won Gold, Silver and Bronze medals of VTU Single Zone TAEKWONDO Championship. The students of GSSSIETW participated in the VTU Single Zone TAEKWONDO Tournament meet held on 28th and 29th, Ghousia College of Engineering, Ramanagaram, Bengaluru. The following students were won the final round over 73kg category where G M Jeevith Gold, Deepthi P R Silver and Amulya D M won Bronze medal under 46kg category. GSSSIETW Team: (Sitting down from Left) Yashaswini K K, Amulya D M, G M Jeevith, Deepthi P R, Indira C T. ( From Right) Anupama B Pandit AAO, Dr Sumithra Devi K A Principal, Vanaja B Pandit, Hon. Secretary, O Prathap Kumar, Joint Secretary, Bharath R K, CEO and Harish Gowda B N, P E Director, GSSSIETW Mysuru. Standind form Left : Harish Gowda B N,Yashaswini K K, Deepthi P R, G M Jeevith, Amulya D M, Indira C T, Sensai Stafford Michahal. The students of GSSSIETW participated in the VTU Single Zone TAEKWONDO Tournament meet held on 28th and 29th, Gousia College of Engineering, Ramanagaram, Benagaluru. The following students won the final round over 73kg category where G M Jeevith Gold, Deepthi P R Silver and Amulya D M won Bronze medal under 46kg category. Benzameer Meera participated in Skating organized by Samsung ISU World Cup, Italy 2013. Chaya M A participated in International Yoga competition held at Mysore, 2013. Event : Visvesvaraya Technological University Interzone Volley Ball Competition held on 20th Feb 2015 at JNNCE, Shimoga. Participants :Naija Anand (VI Sem, ISE), Chandana N (II Sem, ECE), Sangeetha (VI Sem, CSE), Aishwarya Gowda S R (II Sem, EEE), Advika M (IV Sem, IT), Supriya P (IV Sem, CSE), Aleena Alexendar (VI Sem, ECE), Pooja C N (VI Sem, IT). Event : Visvesvaraya Technological University InterZone Badminton competition held on 25th Oct 2015 at NIE, Mysuru. Participants : Uttara A D (V Sem, ISE), Sumaiya B H (V Sem, CSE), Prakruthi M (III Sem, CSE), Sonali Kashyap (VII Sem, EEE). Event : Visvesvaraya Technological University Interzone Athletics competition held on 5th Nov 2014 at Visvesvaraya Technological University, Belagavi. Event : Visvesvaraya Technological University InterZone Throw Ball competition held on 11th Oct 2014 at NIEIT, Mysuru. Participants : Sonu P (III Sem, ISE), Apoorva Prabhu (I Sem, EEE), Bhoomika (I Sem, CSE), Rakshitha R (V Sem, IT), Prakruthi R (III Sem, CSE), Sowmya I (V Sem, CSE), Nalina G (VII Sem, ECE), Swetha G (VII Sem, EEE), Anushree S (VII Sem, EEE), Megha R (VII Sem, IT), Chandana J (I Sem, ECE), Sonali Kashyap (VII Sem, EEE). Event : Visvesvaraya Technological University InterZone chess competition held on 10th Sep 2014 at Visvesvaraya Technological University-RO, Mysuru. Participants : Akshatha (III Sem, ISE), Nethravati (III Sem, TE), Sahana (III Sem, EEE), Supriya (V Sem, ECE). Inter- Department sports competition will be conducted every year in the month of March during Geethayaana- Annual cultural fest.